We sailed around to Buca Bay where our friends have some “sfuff” stored. There we hoped to finish the installation of the humidifier we gave them. It was not to be. Lewis had purchased a used container that was owned by a jeweler. I tried to drill a hole in the floor. No good. Not even with a carbide bit. I needed a hammer drill and we don’t carry that on the boat. Then I tried to drill from the inside out. All I did was make a hole in the inner wall. Oh well. Nothing more to do here. 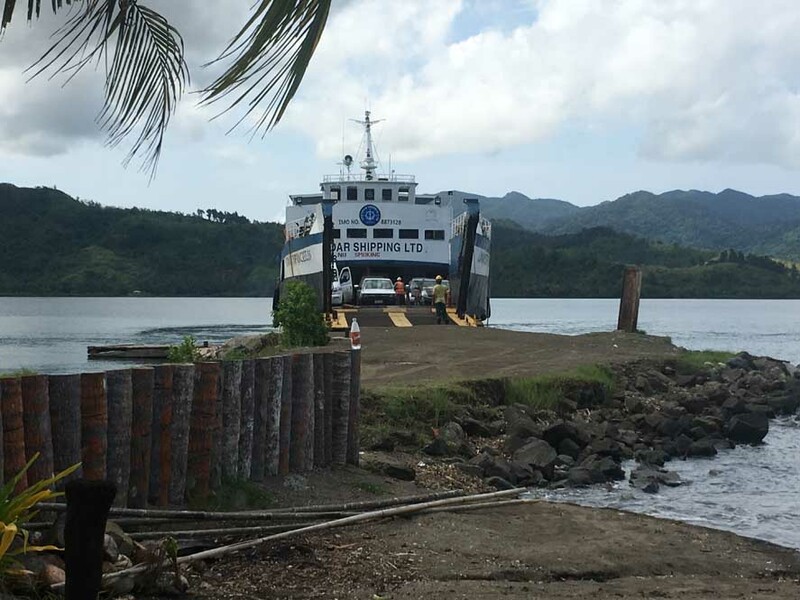 Buca Bay is a major jump off point of the ferry to Taveauni; the Third largest island in the Fiji group. Twice a day a car / people ferry arrives and departs. Two times a day a people / supplies only ferry stops. Additionally; there are smaller panga’s that transport up to a dozen people with limited supplies from various villages nearby. Considering we’re 2 hours by car from Savusavu and a days sail by boat, this was a hopping place. And some days it would be more so. A place called the Mission has been build here by some quite successful US physicians and several times / year various physician groups do outreach. Our cruising friend John had considered having his cataract replaced here but the need was so great he choose to wait. Dentist; oral surgeons, Optomitrist, Opthamologists and many other specialties use the world class facility here. Tomorrow; we head back to Viani Bay.